The Great Lakes Graphics Association (GLGA) recently announced FUJIFILM North America Corporation, Graphic Systems Division an award winner in the 2019 Graphic Excellence Awards competition, recognizing print illustrated with the ‘Award of Excellence’ in a magazine series. The GEA competition is one of the largest printing competitions in the nation. A panel of out-of-state judges with extensive experience in printing and print production were brought in examine all entries, with each entry judges on its own merit in a category with similar printed pieces. Judging criteria included registration, crossovers, clarity and neatness, sharpness of halftones and line drawings, richness and tonal qualities of color, paper and ink selection, ink coverage, difficulty of printing, effective contrast or softness, finishing, bindery and overall visual impact. 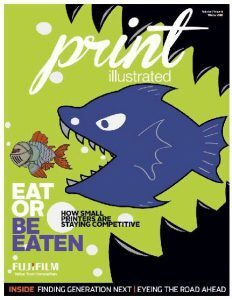 Sign-up for a complimentary subscription to Fujifilm’s award-winning print illustrated magazine.